This may not exactly be your college crew team. In fact, it's not. It's actually just rowing, and it's not even a boat for that matter, but it feels nice. So, I kind of rowed 5000 meters yesterday, which, when you do the math isn't really a big deal, and the fact that I was the only one doing it made me look kind of lame. At least I wasn't as lame as the kid using the climbing machine when the climbing wall is ten feet away. He wasn't lame. Anyway, my trapezius is kind of sore, but that's not really a big deal. 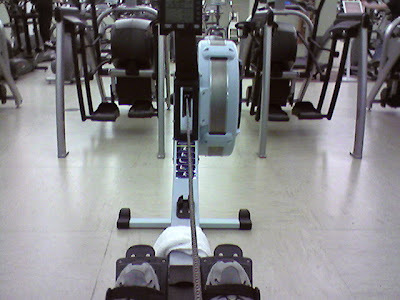 Anyway, feast your eyes on the concept2... aka: the lame rowing machine that nobody ever uses because they want to avoid looking lame, and if they ever do use it, they use it right before the place closes because no one is there to judge them for looking silly. ok. so yes, I am reading blogs late at night because I can't sleep. But the good news is, I think you're funny. Actually, you're a hit in my book. Yup.